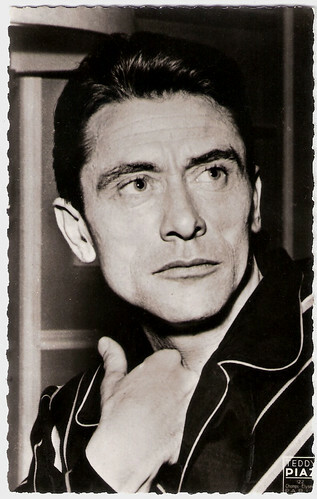 French actor, screenwriter and film director Robert Lamoureux (1920-2011) started as a stand-up comedian avant-la-lettre, and became a charming and funny star of the French film comedy in the 1950s. 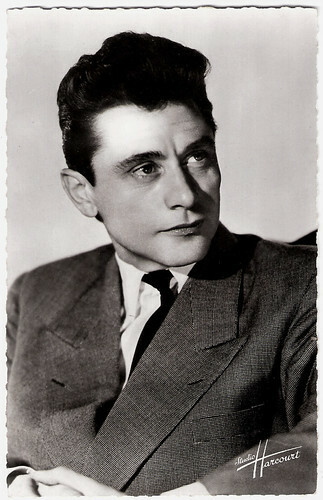 Between 1951 and 1994, he appeared in 37 films, and in the 1970s, he directed the popular farces about La Septième Compagnie (the Seventh Company). Robert Lamoureux was born in 1920 in Saint-Mandé, France. 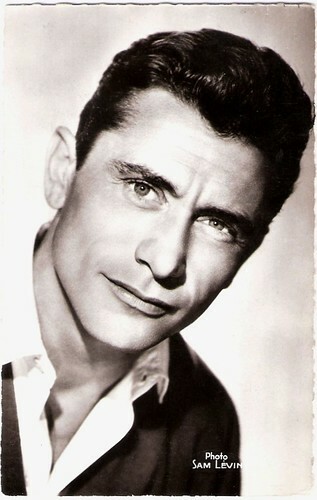 He started his career in 1948 in a cabaret called Le Central de la Chanson. Next he did a revue with Pierre Dac and Francis Blanche at the cabaret of Jacques Canetti. He performed his own songs and recited very funny monologues. He was a forerunner of today’s stand-up comedy, and his success was enormous. As a true showman, Lamoureux subsequently worked in all divisions of the entertainment industry: the music hall, the music record business, radio, theatre, cinema and television. He was the author of several Boulevard plays (popular French stage plays) and received a Grand Prix du Disque (a major award of the French music industry) before he became interested in the cinema. His first roles were in such films as Le roi des camelots/The king of the street vendors (André Berthomieu, 1950), Chacun son tour/Each in turn (André Berthomieu, 1951), and Allô je t'aime/Hello I love you (André Berthomieu, 1952), in which he was charming and funny. He appeared next in the Italian film L'incantevole nemica/The charming enemy (Claudio Gora, 1953) opposite Silvana Pampanini and silent screen legends Buster Keaton and Ben Turpin. 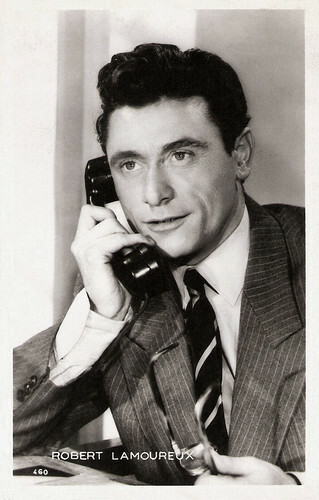 He became immensely popular as Robert Langlois in Papa, maman, la bonne et moi/Daddy, Mommy, the Maid and I (Jean-Paul Le Chanois, 1954), which was inspired by one of his cabaret numbers. He also starred in the sequel Papa, maman, ma femme et moi/Dad, Mom, my wife and I (Jean-Paul Le Chanois, 1955). In 1955 he appeared with Betsy Blair in Rencontre à Paris/Meeting in Paris (Georges Lampin, 1956). Twice he played famous gentleman-burglar Arsène Lupin in Les Aventures d'Arsène Lupin/The Adventures of Arsène Lupin (Jacques Becker, 1956) and in Signé Arsène Lupin/Signed Arsene Lupin (Yves Robert, 1959) with Alida Valli. French postcard. Photo: Sam Lévin. French postcard by Editions P.I., Paris, no. 821. Offered by Les carbones Korès Carboplane. Photo: Teddy Piaz. In 1960, Robert Lamoureux went behind the camera to make film adaptations of the Boulevard plays which he had written. He directed and starred in the situation comedies Ravissante/Lovely (1960) with Sylva Koscina, and La brune que voilà/There is the Brunette (1960) with Michèle Mercier. Both were successful in the theatres but repelled the critics. After a long hiatus in the cinema, Lamoureux reinvented the military farce, notably with the series of La Septième Compagnie, starring Jean Lefebvre, Pierre Mondy and Lamoureux himself. The adventures of the seventh company filled the French cinemas with the films Mais où est donc passée la septième compagnie?/Now Where Did The 7th Company Get To? (1973), On a retrouvé la septième compagnie/The Seventh Company Has Been Found (1975), and La Septième Compagnie au clair de lune/The Seventh Company Outdoors (1977). In 1972, he had a dispute with French singer Claude François. Lamoureux had written a song Viens dans ma maison (Come into my house) and Francois had written the song Viens à la maison (Come home). Lamoureux won the plagiarism case, and Francois had to change the title of his song. Lamoureux wrote several more songs such as Papa, maman, la bonne et moi (Daddy, Mommy, the Maid and I) and Histoire de roses (History of roses) and also some poems like L'éloge de la fatigue (In Praise of Fatigue). Lamoureux played one of his best roles in L'Apprenti salaud/The Apprentice Heel (Michel Deville, 1977), and he appeared opposite Danielle Darrieux and Micheline Presle in the comedy Le Jour des rois/Epiphany Sunday (Marie-Claude Treilhou, 1990). However, he stated that film bored him and that he preferred the theatre. To the stage he devoted the remainder of his career. Robert Lamoureux has been married to Magali Vendeuil, resident actress of the Comédie Française, until her death in 2009. In 2011, Robert Lamoureux passed away by natural causes in Boulogne-Billancourt, France. He had four children, three with his first wife and a daughter with Vendeuil. French postcard by Editions du Globe, Paris, no. 173. Photo: Studio Harcourt. Scene from one of the La Septième Compagnie films. Source: Teddy Leleux (YouTube). Sources: AlloCiné (French), Sandra Brennan (AllMovie), Wikipedia (French), and IMDb.